Blk Sonshine at the Alexander Theatre somehow manage to transcend the venue’s rich ambience. It says a lot. Right in the heart of Braamfontein’s student district, by day the place bustles with workers and thousands of locals who live in the surrounding high rises. And by night the new middle class colonizes the streets: visible, boisterous and good-natured they trek here for sounds like no other. 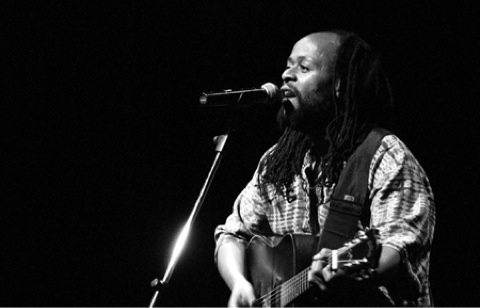 Blk Sonshine is Masauko Chipembere and Neo Muyanga. Their first eponymous release came out in 1998. 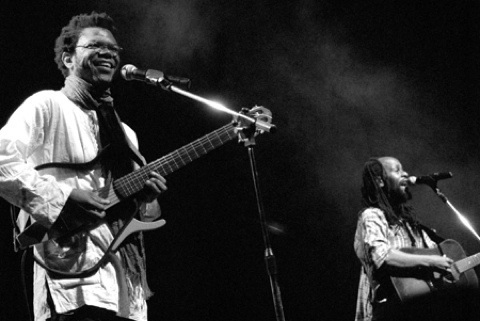 After ten-years, during which the duo split apart, one to the States, the other to Slaapstad, they released their second album, Good Life. 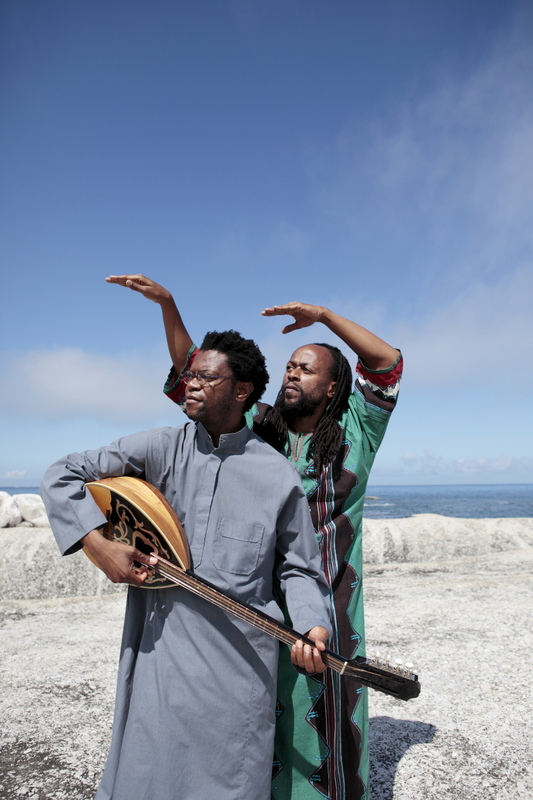 They blend soulful melodies and percussive flurries over an acoustic flow evoking hip hop, jazz and folk among other traditional African influences. The Alexander auditorium was happily full on the night. First up was Bongeziwe Mabandla, an up and comer, who dazzled with nothing besides a voice and a guitar, sincerely setting the tone for the show. After him was Two-parts Black who have rapturously diverting harmonies, then Tumi Molekane, poet turned MC, joined in. With spryly conscious rhymes and velvet lyricism, he was always going to be a crowd pleaser. Then Blk Sonshine took over. I had to recline in my seat and take in the music. It was like a show tailored just for me. The band played a set list right out of my dreams. “Borders”, “Born in a Taxi”, “Building” and “Crazy,” – all firm favourites. Painter Nico Pocco – who did the covers for both their albums – dressed in a dashiki and white pants busied himself with canvas and paint (dirtying his pants). Soon an abstract painting emerged. The artist who has been with them from the beginning is a testament to the band’s easygoing commitment to keeping in touch with their roots. You’ve got to love that. There’s sometimes a moment when audience and band are in unison live. Brought on by a familiar note, a gesture or a shared something in a song. At this show that moment happened during the tantric “Soul Smile”. Helped by its acoustic sparseness which enables intimacy as the vocals sink foxily in. 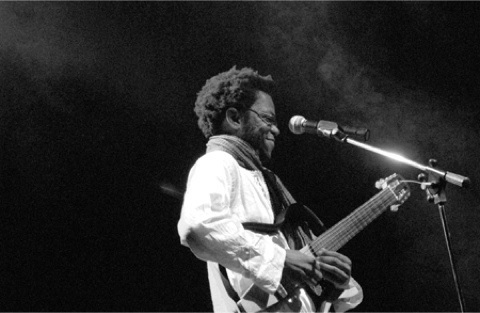 The night came to a euphoric close with the song “Bahlalefi” (Sotho for “wise people”) from the first album. It seemed an appropriate end to a show dedicated, movingly, to the memory of Robbie Jansen and the dear departed Busi Mhlongo. Blk Sonshine are carrying the fire. We should thank them.